Observation - Greenfinch in my garden - UK and Ireland. 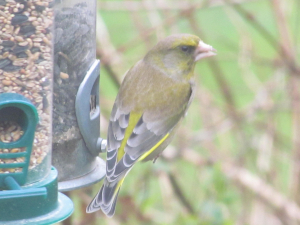 Description: These Greenfinches spent ages on my feeders today, it was very cold again and I think they were after sunflower seeds.Taken through the glass of my patio doors so not great images. These Greenfinches spent ages on my feeders today, it was very cold again and I think they were after sunflower seeds.Taken through the glass of my patio doors so not great images.